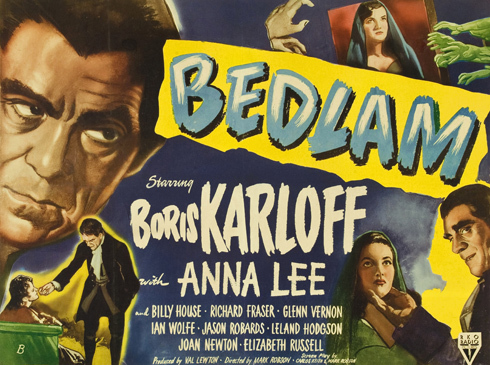 Bedlam, the last in the series of Val Lewton’s stylish horror films for RKO, and the producer’s last collaboration with Boris Karloff, was released on the 10th of May, 1946. Starring opposite Karloff is Anna Lee, as the feisty reformer Nell Bowen, who determines to improve conditions and treatment of the inmates at the notorious asylum. Bedlam was inspired by William Hogarth’s A Rake’s Progress, and tells of the events occurring at a fictionalised version of London’s Bethlem Royal Hospital in the mid eighteenth century. Such was the series of paintings’ influence on the production that Hogarth was given a credit in Bedlam’s titles. 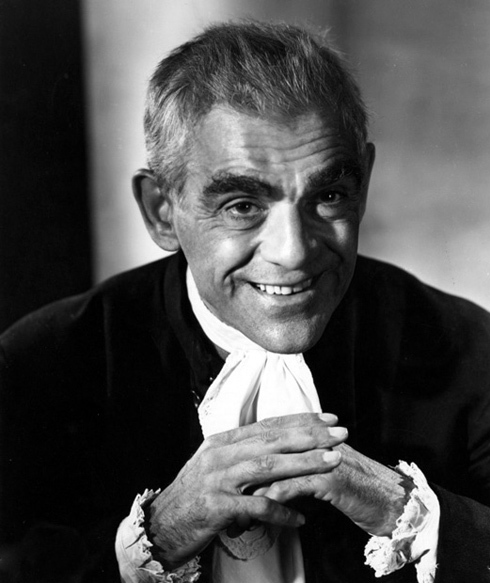 Karloff plays the sadistic apothecary general, Master George Sims, who rules over the hospital with an iron fist, committing all manner of cruelty against the helpless inmates. Although the character is fictitious, it borrows heavily from the notorious head physician at the real Bethlem, John Monro. In the film, Nell is the protégé and companion of of the aristocratic Lord Mortimer (Billy House) who reluctantly acquiesces to let Sims commit her in order to stop her expensive reforms. Believing the experience will break her, Sims leaves her at the mercy of the inmates, who he describes as being “fierce as wild bulls, untameable as flies, these have oft from strangers’ side snatched rapiers suddenly and done much harm”, a quote better known from the play, ‘The Honest Whore’ by Thomas Dekker and Thomas Middleton. Asylum seeker: Nell Bowen (Anna Lee) meets inmate Dan the Dog (Robert Clarke) after requesting Master George Sims (Boris Karloff) shows her round Bedlam (RKO 1946). As Nell defies Sims and enlists the help of politician John Wilkes (Leland Hodgson) and the Quaker Hannay (Richard Fraser), he determines to stop her once and for all by administering his strongest ‘cure’. The “loonies” however have other ideas, and Sims gets his final comeuppance as the day is saved by their own rough justice. Controversial and contentious in its day, Bedlam still packs a stylish punch decades later. It is Lewton story-telling at his best, carefully crafting the screenplay under the pseudonym of Carlos Keith in collaboration with director Mark Robson. 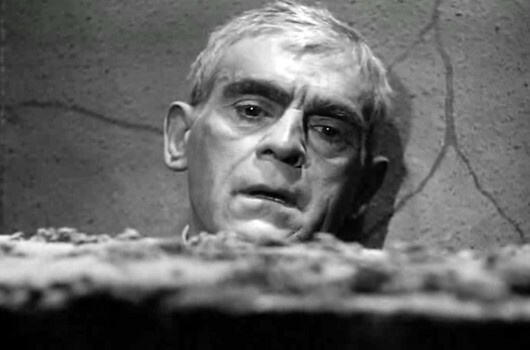 In this, as in each of the RKO classics in which he starred, Karloff excels himself, wringing every last vestige of character out of the accomplished writing. As the evil Sims he lights up the screen, and it is clear to see why he revelled in these stark, psychological and melodramatic thrillers more than in Universal’s unsubtle monster staples. He has fine support, too, from the competently challenging Anna Lee, right through to the wickedly delightful Elizabeth Russell as Mistress Sims, Nell’s antipathetic replacement. Advocating a touch of Charles Dickens’ welfare reforms, Bedlam tells us how things were in the relatively dark ages of the mid-1700s and, although it seems a million miles away from what could happen today, for this reason is an important piece of social history.